ZenOffice, Manchester’s only authorised Xerox Concessionaire, has seen its turnover grow by 37% in the last year; with a 15% contribution thanks to growing customer demand for Xerox managed print services (MPS). 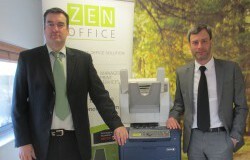 To meet this growing demand, ZenOffice has also recently appointed two new salespeople. Wayne Phillips has been appointed Senior Account Manager. Phillips will hit the ground running having amassed 15 years in the managed print services industry, dealing mainly with the Xerox offering. Ashley Parkinson has joined the MPS team as Business Development Manager. Parkinson has spent the past 10 years developing sales for print and new media solutions to SME’s for Yell. Established in 1972, ZenOffice has provided North West businesses with office supplies, print and design and a business interior service. Xerox, the world’s leading enterprise for business process and document management, appointed ZenOffice in January 2012 as an authorised reseller of its managed print services offering, Xerox Partner Print Services. Mark Duffelen, Director and General Manager, Channels Group, Xerox UK and Ireland said, “This is a tremendous achievement by a company that has been offering Xerox Partner Print Services for only 12 months. We look forward to continuing our successful partnership with ZenOffice”. Xerox Partner Print Services is a comprehensive set of tools (powered by Xerox), services and support to enable Xerox-accredited partners to provide their clients with a better way of managing their office print costs and infrastructure. Clients who are saving money on their print costs with ZenOffice include one of the world’s largest providers of business critical communications, DST Output and Rilwood Associates, a national executive recruitment company.